I put the box in the fridge overnight, and when I woke up the next morning, the first thing that came to mind was the unknown contents of the Mystery Box. 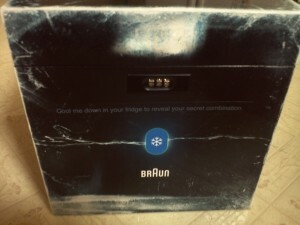 The three digit code revealed itself, so I popped open the box and was suddenly exposed to the new Braun CoolTec dry shaver. So how does CoolTec work? Instead of applying gels or moisture during or after your shave, CoolTec addresses the issue by cooling the skin throughout the process of shaving. How does Braun accomplish this? By employing Thermo-Electric Cooling technology, or “TEC” for short. 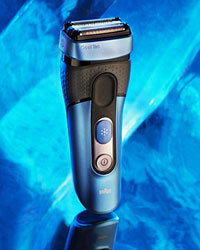 Skin irritation comes from cutting parts moving inside the shaver, as well as the shaver’s interaction with the skin. The skin can penetrate through the small holes of the shaving foil, forcing it to come into contact with the shaver’s cutter. OUCH! I know it hurts from experience, but reading the science behind it somehow makes it hurt more. CoolTec has an aluminum cooling bar integrated into the shaving head. With the press of the CoolTec button (complete with “snowflake” icon), the aluminum cooling bar gets super cold in a hurry and cools the skin while you use the shaver. For comparison sake, the cooling bar felt just like the cold piece of aluminum a cut man uses between rounds in boxing or MMA, called an “end-swell.” The cooling bar works in a similar fashion, calming the skin and dissipating pressure built up by the shaving head. The shave was so smooth that I couldn’t believe it wasn’t from a razor. I kept asking the girls in my office to rub my face to make sure I wasn’t dreaming. Two out of three obliged, and they remarked how soft my skin was. Then they asked about my “other hair” and if I was “that smooth everywhere.” I work with some really cool girls. The CoolTec has a great weight to it. It’s heavy enough to feel solid, but doesn’t feel cumbersome or impede the shave. Its ergonomic shape also makes the CoolTec easy to navigate, complete with tapered handle and thick shaving head, and the rubber grip accents are a nice touch. A lot of thought clearly went into the function and design of the CoolTec, and even if you’re a shaving novice, you can feel the difference. So ditch your crappy import and upgrade to the BMW of dry shavers, because the CoolTec from Braun is the “coolest” dry shaver on the market. Come on, you didn’t think you were going to get out of here without at least one of those, did you? For product descriptions, videos and more, visit the Braun CoolTec website here.